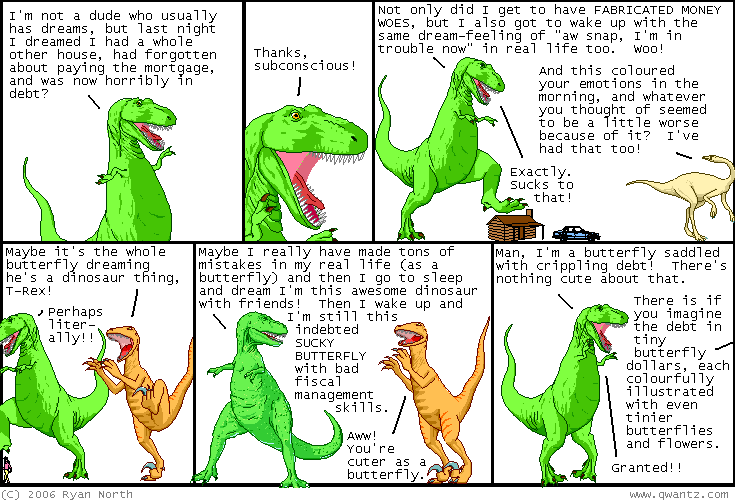 Dinosaur Comics - September 12th, 2006 - awesome fun times! September 12th, 2006: My friend Poster Child, who you'll remember from the Mario Blocks art project he's done and that time that got some women in trouble in Ohio, has a new site! This site will hopefully not lead to ARRESTS. It is called Poster Child's Blade Diary and it is a daily stencil site! I helped him set it up which explains why the design is so uncannily familiar. Every day he posts a new stencil (both the design AND the stencil's placement in the real world) and it's pretty neat! My favourites from what he's put up somewhere are the Turingnator ("What if Alan Mathison Turing - the man often considered to be the father of modern computer science - was actually a highly specialized T-800 model, sent back in time to ensure the eventual creation of Skynet?") and Orphaned by Nicolae Ceausescu's Policies. One year ago today: i'm so intense, dude.